We are currently working on getting my craft room finished, but for now I’m using a smaller room in my home. I’ve temporarily set up most of my storage units, but have been using a long folding table to craft on. It was way too big for the space and didn’t have added storage for all my supplies. IKEA has these awesome desk tops for only $25 and I found the bookcases at Wal-Mart for only $15 each. The IKEA top is called Vika Amon, but might be limited to only store purchases and not in the catalog. 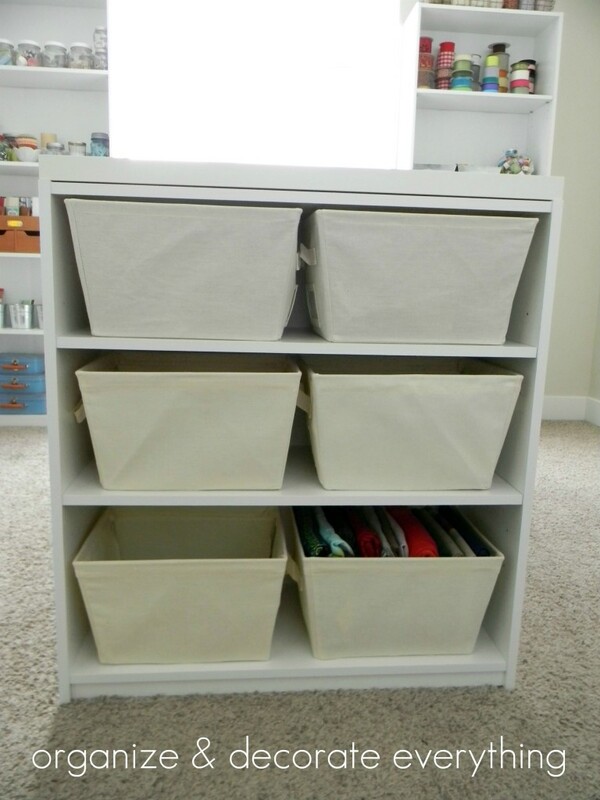 A whole new DIY craft table with storage for only $55. I think that’s an incredible deal. It can be adapted to be used in almost any space and it can be easily moved. Just use liquid nails to add a piece of wood to the underside of the table top to hold it in place between the 2 bookcases. It can be easily taken apart in less than a minute. The best part is the extra storage. 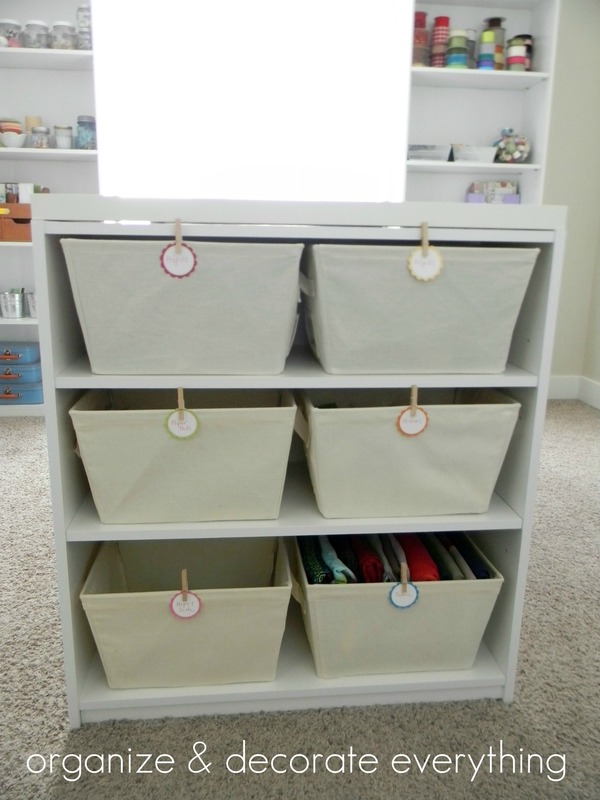 By adding baskets you can store practically anything out of sight. If you wanted to display the items, just leave the baskets out. I added tags to my baskets since I’m using it in a craft room and I want to be able to find things easily. The table sets about the height of a low bar so the short bar stools work perfectly. I’m looking for an adjustable stool for mine. Maybe a bright red one to add some awesome color to the space. BTW: I just noticed I’ve reached over 2 million hits since this little blog first started. You are all so awesome! Thank you for making this happen! Wow! Can’t believe three items can produce such a great workspace! Have fun decorating your new room! I went to a garage sale over the weekend and got 2 two drawer files and a door all for $20.00 to make a desk. They need a little tender care but I can’t believe the bargain. Can’t wait to get my craftroom in order. Thanks for your blog and fantastic ideas. Great work thinking outside the box with separate shelves and a desk top! Awesome idea! 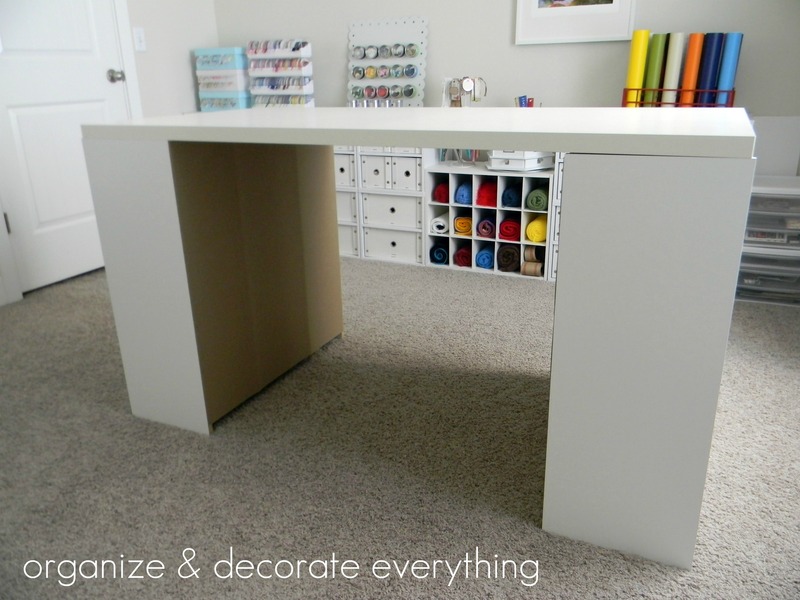 If I ever have a craft room, this will be my table! I am featuring this at somedaycrafts.blogspot.com. what was the desk top from ikea called? is it the vika amon? that’s an awesome table! I so wish I had a craft room! Love the new craft table! And congrats on hitting 2 million!! WooHoo!! I love this. Have seen many similar and love the idea. I made a table also out of MDF with table legs, but when we move, I am feeling that I will have to make one like this. Can I ask the name of the tabletop? I love this idea! Which table top did you get? Or at least, what are the dimensions so we can find a similar sized one? What a great idea-love your creativity-following you from beneath my heart-stop by for a visit! definitely going to look for those shelves today. HI what is the table name called and what are dimensions? Can wait to get started on this! thank you for this idea! my husband just made me this for my birthday. 🙂 my table top is MDF since ikea is too far away; found it at a door manufacturer and he cut it to size, which cost less than at a big box store so even better. I found the bookshelves on the Walmart website…says they are 32 inches in length….but I cant find a table top on Ikea website that measures 32 inches???? Your pics show that your table top & shelves match up perfectly….help???? I can’t find a table/desk top with the right dimensions on the Ikea website. Which one did you purchase? I know several other people have asked already, but it doesn’t seem like you’ve responded. What are the dimensions for the tabletop and bookshelves? I am unable to find ones that match. @Katie. I just did this myself and found the bookcases she used at Wal-Mart. The brand is Mainstay. It’s a three shelf bookcase. It’s exactly 29 1/2 deep just like the table top from Ikea. The bookshelves are somewhat sturdy. You might want to pay a little extra for more sturdy “legs”. Table Top from IKEA is Vika Amon 59″ width and 29 1/2 depth. The white is $25.99. Black/Brown or gloss white or gloss red which is awesome by the way is $35.99. The bookshelves are from Mainstay at Wal-Mart. They are exactly 29 1/2 ” deep, same as depth of table top. hi laurie! i’m looking to do a very similar table! do you have a specific name/link for the bookshelves? Good project. I suggest you paint your clothespins to support the happy mood in your craft room. Loving the blog. Some great ideas here. I’m trying to get my rented small flat organised without spending much money or making any permanent changes, which is tricky! I’ve already created a wall of wool using cheap ikea storage boxes for my burgeoning yarn stash! I love this! I made it for my craft room so my daughter and I could craft together. I just want to let you know some unfortunate news. I went to purchase these bookshelves at Wal-Mart and was informed that they are discontinuing these shelves. I had to go to3 different stores to find them. The table top is called Vika Amon or Amon Vika. I can’t remember what order it goes in. It’s $25 but I haven’t looked for it on their website or in the catalog, I bought it at the store. How do you take this apart? Isn’t it hard since you used liquid nails? The liquid nails is only applied to the 2×2 board running along the underside of the table top to keep it in place between the 2 bookcases. None of the 3 pieces are glued together. It comes apart very easily. I love it! I might have to make a craft table for my home office. There’s already a desk in my home office, but I’d like to replace it — my knees keep hitting the bottom of the desk! (Despite the fact that I am more petite than tall!) I really like the labels you added to the bins, and how you attached them with clothespins — very cute! 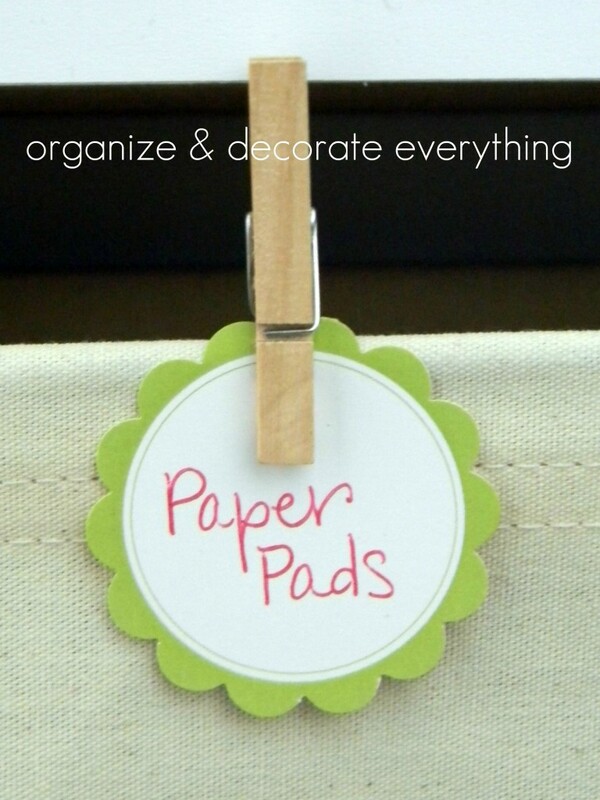 The clothespins would look very cute with some scrapbook paper Mod Podged to them. I think your idea would work fine. I just used a 2×2 piece of wood cut the length of the table top minus the bookshelves and secured that to the underside of the table top using liquid nails. I used a piece of 2×2 wood cut to the size (length) of the table top minus the bookshelves. Once you have the table in place, adhere the wood strip to the underside of the table top in the center of the table. I used liquid nails. Only adhere it to the table. Take the table top off and place something heavy on it until it dries. Now you can place it back on and the wood strip will hold it in the right place so it doesn’t slip but you can still take it apart when you need too. May I ask where you bought your baskets (since they fit so perfectly in the bookshelves). I purchased them at Wal-Mart. It appears that the table top is an Ikea Linmon, article number 202.511.39. It’s actually the Vika Amon table top. Yes, but I was unable to find the Vika Amon on the IKEA website. In fact, a search for “Amon” by itself does not yield any hits. It appears that the Linmon is the same size and price, so I thought it might be helpful for people who want to build this setup. Bummer… I just ordered the Linmon from Ikea but can’t find the Mainstays 3-Shelf Bookcase, White in any of the Walmarts around here. It is only sold in-store. Oh well, I will try to find other book cases. Thanks for sharing. They no longer make the Vika Amon. They are replaced by the Linmon. This would totally work in my new office space! I did something similar. http://www.hometalk.com/752216/my-newly-redone-scrap-booking-area. It was easy and the desk comes apart with the tap of a hammer. Love this idea. Have a couple of questions. Quick question has anyone had a problem with how much weight the bookshelves can hold? I just made this with the Mainstay bookshelves from Walmart (which are $16 now btw). They are EXTREMELY flimsy and sway side to side. I think I will reinforce them with some “L” brackets. I’m sorry you’re having problems with the bookcases. I have moved them 3 times and have never had problems with them swaying or being flimsy. Leaving the back off the bookcases might be causing this problem. Love this! Just bought the table top online from ikea. $18.00, including shipping & tax! Woohoo. Going to get the shelves next. What type of wood did you use for the underside of the table? Can you please post a picture? I didn’t have a table top but we did a little remodeling and had a left over piece of plywood. I went to Walmart and bought the two bookcases and ended up with the something similar too! I will be your follower!! This is a stellar idea!! what size top did you get at Ikea? You rock!!! I’m a new home owner who’s on a tight budget. I just ordered the pieces for this craft table. The IKEA desktops were amazingly cheap and the Walmart bookcases were on sale! Now I can scratch the plans I had for making tables with cinderblocks and slats of wood. 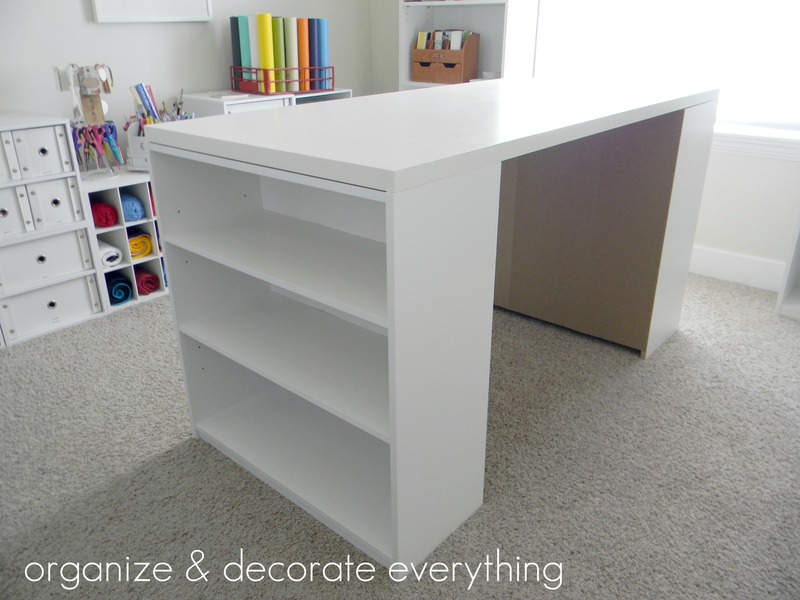 Can’t thank you enough for sharing this GREAT DIY Craft Table! !